In a previous post I discussed the importance of making discussions around theme in the classroom a commonplace experience grounded in the lives we live each day. As a result, students are better positioned to identify and interpret theme in and across the texts they read. Theme is a thread that runs throughout a text and evokes an emotional response within the reader. However, teaching students to notice and latch onto this abstract thread is a challenge we face in our classrooms each year. This teaching involves helping our students to draw upon multiple literary elements to arrive at a deepened understanding of theme. And in doing so, there are three major pitfalls we’ve experienced with our students. Anticipating these pitfalls helps us steer our students toward using the critical thinking skills they’ll need to identify and interpret themes. The following chart describes the pitfalls and offers strategies to avoid them. Students who can become bogged down in summarizing the plot when asked to explain theme or provide text evidence. Help students learn to differentiate between the events of the story and the theme of a story. Practice this process using a well-known animated movie like The Lion King or Finding Nemo. On a graphic organizer, chart paper, or using an interactive whiteboard, invite students to briefly detail the plot of this text in 2-3 sentences. Then, ask them to try to express a theme that runs throughout the entire text. When students can see plot and theme side-by-side, it helps them to understand that theme is universal, not confined only to a specific text; it lives in our lives and in the world. Students who rush and identify one event or moment in the story as a theme without text evidence from across an entire text to support their idea. Help students to slow down, step back, and consider revising their idea. On a graphic organizer, chart paper, or using an interactive whiteboard invite students to find text evidence that supports their ideas about a theme from the beginning of the text, then the middle, and finally the end. If they aren’t able to find text evidence to support their claims about theme from these three parts of a text, then they must consider that they’ve made a rushed decision that could be wrong. Ideas must be deeply rooted in and across the text! This process can also be practiced with a shared or well-known text. Students who limit a text to just one theme and tend to identify and repeat this same theme from text to text. Help students avoid locking in on the idea that there can be only one theme in a text. Create a graphic organizer, chart, or use an interactive whiteboard to invite students to jot down events from the plot of a shared or well-known text. Group these events and challenge students to name a different theme for each group that relates to the events. This process requires students to slow down and think deeply by considering alternative possibilities and then selecting a theme that resonates most powerfully with strong text evidence. Graphic organizers for these pitfalls and additional strategies can be found in our book: Teaching Interpretation: Using Text-Based Evidence to Construct Meaning. These strategies have have made the process of understanding theme more concrete for our students. Helping students to strengthen their identification and interpretation of themes positions them to support and elaborate on their ideas powerfully using strong text evidence. 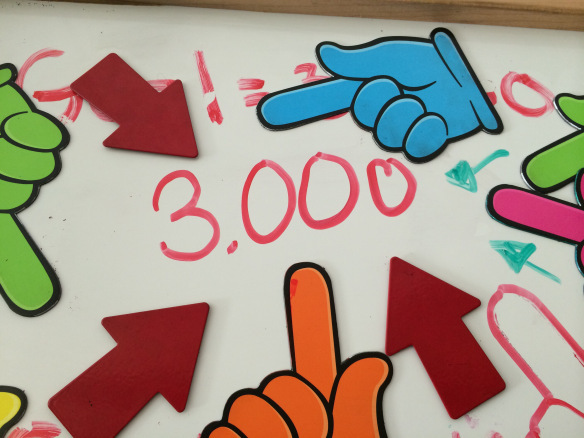 My students reached our class reading goal this year- 3,000 chapter books and 10,000 picture books. It felt good. They read a lot and met many of their personal reading goals. But we just barely squeaked by. They had to read A LOT in May. Now, as I reflect on my reading units from the past year, I am thinking about the ways I balance reading for volume with opportunities for close reading in my workshop. Both are very important. Too often, however, in my 50 minute middle school English classes, I meet a conundrum- how do I prioritize independent reading and still make time for close reading? Inspired by the work of Lucy Calkins, Ellin Keene, and Donalyn Miller, I hope to develop lifelong, independent readers. The need for eyes-on-text reading time is invaluable in the reading workshop. Read anything Allington or Cunningham & Stonovich, and you’ll find research that shows that reading success is directly linked to volume of reading. Likewise, students who struggle read significantly less than their peers and may continue to fall behind without interventions that include reading for volume. In addition, I know that close reading is important for my students. I LOVE rereading Chris Lehman and Kate Robert’s book Falling in Love With Close Reading– if you don’t have a copy, it is a must-have! Their strategy of teaching close reading through the application of lenses is very similar to how Sonja and I have approached helping students interpret text in our book, Teaching Interpretation. Slowing down, reading and rereading a text or passage of text closely through one lens gives students a purpose and helps them examine a text in a way that they might not try on their own. Practicing these reading strategies is essential to helping students further their growth as readers and thinkers. Using read alouds as purposeful mentor reading texts that we can come back to again and again for close reading. This way students are already familiar with the texts- can try on new lenses, look at patterns in new ways, and change their interpretations over time. Use high-engagement, short texts. Students may be familiar with songs, poems, commercials. May shorten the time since students will already be familiar with the text. Use a flipped-classroom approach for some close reading strategies. Consider length of text and type of text. Could use pamphlets from rest stops, stores, coupons, etc. Connect with content areas to encourage close reading. Possible places to overlap and share texts? Please let me know your ideas, too. I am going to keep adding to my list as I read new professional development books this summer. 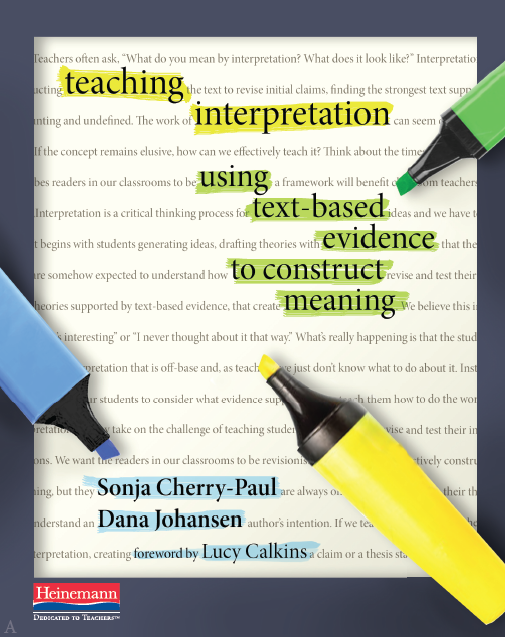 Our first book, Teaching Interpretation: Using Text-Based Evidence to Construct Meaning has arrived! After more than a combined two decades of teaching, you might think that for Dana and I, teaching our students to interpret texts is easy. And yet, each year we are challenged in ways that continue to surprise us. Each year, we spend countless, (sometimes pull our hair out), hours puzzling over ways to make our teaching stronger. We continue to question, how do we teach our readers to take a piece of literature and examine it from every direction, from every facet. To see inside of it and let it spark an idea they can stoke and turn into a brilliant flame. We question whether we’re asking too much of our students; if our expectations are simply too high. And yet, during conferences and small group conversations about texts, we witness again and again, the insights our students bring to and gain from their reading. We are reassured each year that by setting high expectations, our teaching becomes more focused and we renew our commitment to our students. This is what led us to write Teaching Interpretation: Using Text-Based Evidence to Construct Meaning. We’ve written this book as much for ourselves as for all teachers who continually strive to improve their practice and teach in ways that stick. We know that the work of dedicated teachers is tireless and often without validation. In these standards driven times filled with talk of teacher accountability and too little talk of teacher support and recognition, we’ve written this book to pay tribute to the indelible ways teachers influence the lives of children. And so, we dedicate our book to teachers everywhere. We hope you enjoy!